Last week, my friends at the National Peanut Board asked me to share a favorite tailgating recipe. If there are two things we Georgians love, it's tailgating and peanuts so I rushed this recipe right over which was featured here. 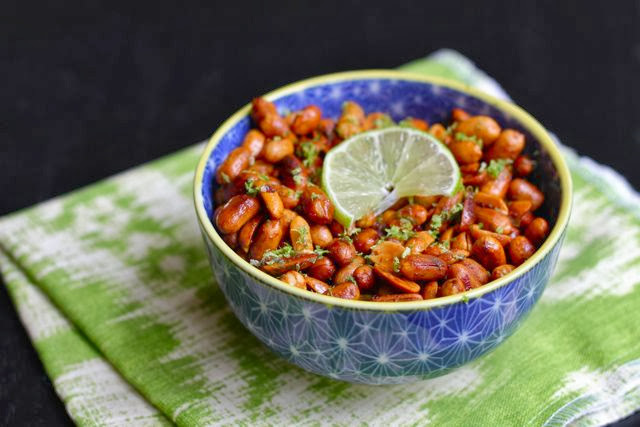 These crunchy, slightly spicy chili-lime peanuts are one of my favorite ways to dress up that jar of peanuts sitting in the pantry. Quick and easy recipes like this are great to have on hand for impromptu parties and surprise visitors too. Hop over the the National Peanut Board blog to find more delicious peanut recipes! Preheat oven to 350 degrees. Toss peanuts, olive oil, salt and sugar together in a bowl and coat evenly. Pour mixture onto a rimmed baking sheet and arrange in a single layer. Roast nuts until fragrant, stirring occasionally for about 15 minutes. Remove from oven and transfer to bowl. Add lime juice, pepper sauce, cayenne pepper and lime zest to peanuts and toss to coat. Nuts can be made a week ahead! Store in an airtight container in the refrigerator. Holy cow, these look so good!! How wonderful would pumpkin seeds be, too?! Yes, great idea about the pumpkin seeds!! !